For the most part, windows are windows from program to program. You’ll probably notice that some programs (Adobe Photoshop or Microsoft Word, for example) take liberties with windows by adding features such as custom toolbars or textual information (such as zoom percentage or file size) that may appear around the edges of the document window. The following list gives you a look at the main features of a typical Finder window. If your windows don’t look exactly like the one shown, don’t be concerned. You can make your windows look and feel any way you like. Moving and resizing windows are easy tasks. Close, Minimize, and Zoom buttons: Shut ’em, shrink ’em, and grow ’em. View buttons: Choose among four exciting views of your window: Icon, List, Column, and Cover Flow. Arrange menu: Click this little doohickey to arrange this window’s icons by Name, Kind, Application, Date Modified, Date Created, Date Last Opened, Date Added, Size, or Tags. Or, of course, by None, which is the default. Command-click the name of the window to see a pop-up menu with the complete path to this folder (try it). This tip applies to most windows you’ll encounter, not just Finder windows. So Command-click a window’s title, and you’ll usually see the path to its enclosing folder on your disk. You can also have the path displayed at the bottom of every Finder window by choosing View→Show Path Bar, as shown in the active window (Bob). Share menu: Another button that’s actually a menu; click it to share selected files or folders via email, Messages, or AirDrop. Tags menu: Yet another button/menu; click it to assign a tag to the selected files or folders. Search field: Type a string of characters here, and OS X Yosemite digs into your system to find items that match by filename or document contents (yes, words within documents). Scroll bars: Use the scroll bars for moving around a window. Sidebar: Frequently used items live here. Window Resizer: This helpful little visual cue appears when you hover over an edge or corner of a window, or over the dividing line between two panes in the same window (the Sidebar and main area of Finder windows, for example). If you click a Resizer, you can then drag the edge, corner, or dividing line to resize the window or pane. Forward and Back buttons: These buttons take you to the next or previous folder displayed in this particular window. If you’re familiar with web browsers, the Forward and Back buttons in the Finder work the same way. The first time you open a window, neither button is active. But as you navigate from folder to folder, these buttons remember your breadcrumb trail so you can quickly traverse backward or forward, window by window. You can even navigate this way from the keyboard by using the shortcuts Command+[ for Back and Command+] for Forward. The Forward and Back buttons remember only the other folders you’ve visited that appear in that open window. If you’ve set a Finder Preference so that a folder always opens in a new window — or if you forced a folder to open in a new window, which I describe in a bit — the Forward and Back buttons won’t work. You have to use the modern, OS X–style window option, which uses a single window, or the buttons are useless. In Snow Leopard and earlier releases of OS X, if you hid the toolbar, the Sidebar was also hidden, whether you liked it or not. Conversely, if you wanted to see the toolbar, you’d have to see the Sidebar as well. 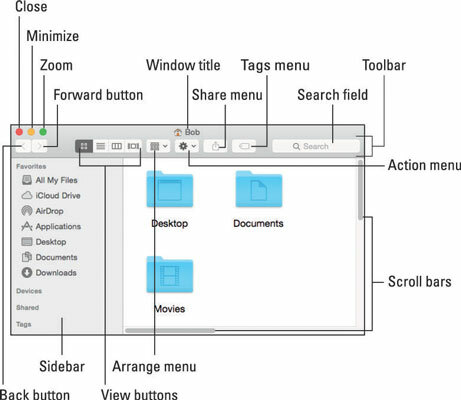 Yosemite gives you the flexibility to show or hide them independently in its View menu.